"Brands Hatch proved that I'm fit enough to do consistent laps over the race distance which can only help bring me the results I need. I spent many hours over the winter months on the turbo trainer in the workshop after work which has definitely helped me up my general fitness. "This weekend's results also gives me a huge amount of confidence as I bid to challenge for race wins. I took a knife to a gun fight last year, it seems, running a totally stock road engine. The "Superstock" rules allow certain internal changes that help improve the power and torque but that was out of my budget last year. The winter break allowed me to make those changes and has levelled the playing field. To be right on the money straight away shows how much it was holding me back last year! People kept complementing me over the weekend saying how fast the bike looked but in reality I was having to ride the wheels off the thing last year just to keep up. Now that same commitment brings much better results! 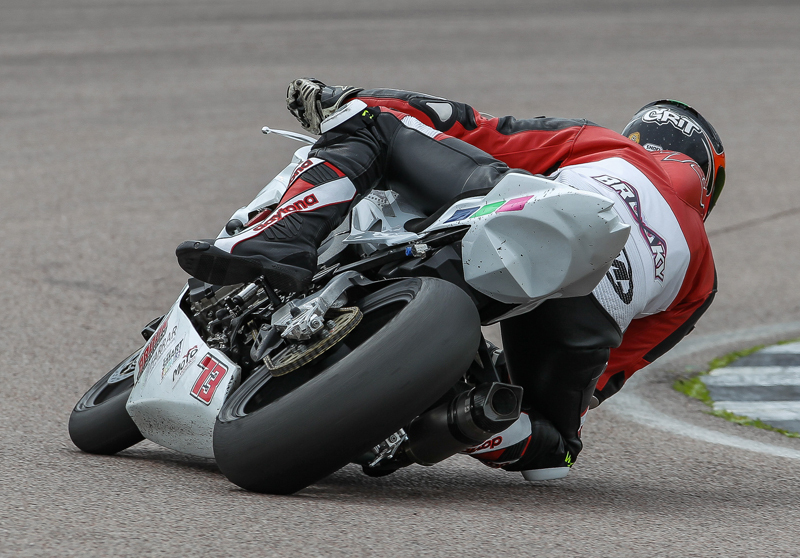 We had good pace in testing and qualified 3rd in stock behind BSB rider Craig Neve and reigning Superstock 600 champion Adam Shelton. I felt satisfied with that but knew I could improve. In race 1 I brought it home in 5th, I wasn't ruthless enough with the back markers I came across and I paid the price losing 2 seconds in one lap and one second per lap in the two that followed which lost me two positions. We made some changes overnight and were second fastest in warm up so I knew we were onto something. I managed to get off the grid and break away with the front wave finishing 3rd and almost a second quicker than Saturday. Race 3 saw me gain an equally a good start despite the poor grid position and after the first flying lap I was leading the Stock 1000, I continued to do so for most of the race until I came unlucky with a back marker going much slower than me in one of the turns and a momentary closing in the throttle lead to Craig Neve passing me never to be seen again. Overall it was an awesome weekend with two podiums and the closest I've ever got to a race win in the GP1. I'm all revved up for Donington in April!" added David. Brighouse-based Arkoni Metalwork, who sponsor 'Brooky', are once again supporting the Bradford rider's endeavours. MD Mark Prentice commernted: "Brooky had a fantastic first season in 2014 and, on the strength of Brands Hatch, it looks like 2015 will be even better. "Everyone at Arkoni is right behind him and we'll be present at all of his races throughout the season," added Mark.